Suitable for Home, Kitchin , Hotels, Shops, Restaurants, etc. Perfect gift for your friends! The world's top brands will be used on kitchen utensils. Chromium makes the steel with rust protection layer, nickel is to protect steel acid corrosion. Many unscrupulous businessmen use 200 series stainless steel, heavy metals exceeded easily! Short can handle jammed deep saucepan edge, easy to fall. Two hands are all laser welding, soldering traces the outer wall of the pot, is normal. but microwave heating, less Good control the time and firepower, often make chocolate void. although it is more slowly than the microwave method, but the most effective. Easy to use. 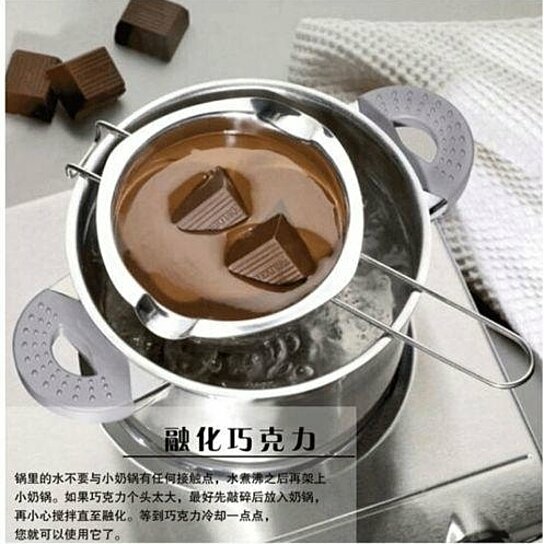 for Melt chocolate, butter, candy, heating milk and etc. Safe and healthy.long handle design,do not worry about that would hurt your hands. During the manufacturing process, it can have small scratches.